'Desert Trumpet' OGB- (Lin Flanagan, R. 1990). Seedling 82006-1. AB (1/4), 30" (76 cm). Early bloom. 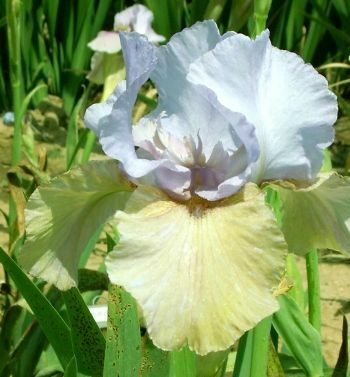 Standards light violet; Falls violet and yellow mixture (not blend); dark violet beard; flaring and ruffled. Unknown 1/2 AB seedling X 'New Moon'. Aril Society, 1991.